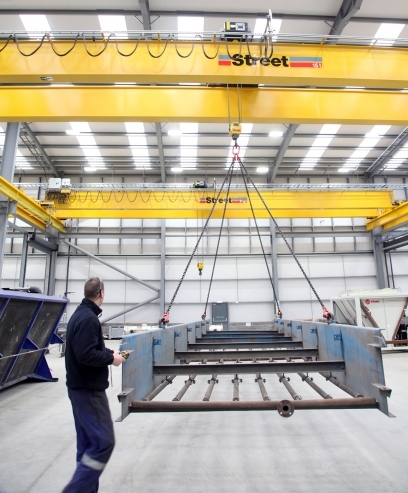 A leading UK manufacturer has selected Street Crane to supply and install overhead cranes at a new state-of-the-art fabrication facility, which will enable the business to expand its services and meet growing customer demand. Thornhill Heat Exchangers is the UK’s leading manufacturer of rubber gaskets and plate heat exchangers. The company chose Street to help optimise its manufacturing capabilities at a new site in Barnsley, South Yorkshire, which is the base of its engineering division. The team produces a range of large industrial heat exchangers including plate, shell-and tube, and fin-fan as well as large storage vessels. The products are used in a variety of industries including steel manufacturing, food processing, chemical and shipping. Six overhead Street cranes have now been installed in the new facility, one with a lifting capacity of 10 tonnes and five with a lifting capacity of 15 tonnes. The cranes are being used to lift materials such as carbon steel, stainless steel, brass, aluminium and titanium onto machines which are controlled with CNC (computer numerical control) and used to manufacture the heat exchangers. The cranes will also be used to handle the newly fabricated storage vessels which will be produced at the site. Mark Ingram, General Manager at Thornhill Heat Exchangers said, “This site is home to a new division which uses the latest technology and will significantly expand our product range. 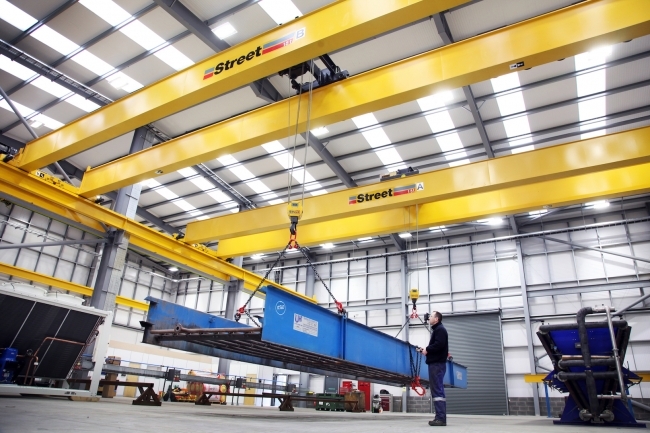 “We needed overhead cranes that would enable us to efficiently and reliably move large and heavy materials around the new site, ensuring maximum productivity.